ET’s Rashmi Rajput decodes how the ruling BJP reached the magic number of 20. The BJP has 12 numbers and it was trying to get the support of MGP ( 3 MLAs) , Goa Forward Party (GFP) and Independents (3). GFP leader Vijay Sardesai and MGP leader Sudin Dhavalikar drove a hard bargain, both demanding DyCM posts. The BJP reluctantly agreed, but then it was the turn of the two remaining MLAs of MGP to demand ministerial berths. They agreed to cross over to the BJP, leaving Dhavalikar out. The tally reached 20 and Dhavalikar lost everything. Sources say swearing-in ceremony likely to be at 11 pm tonight. 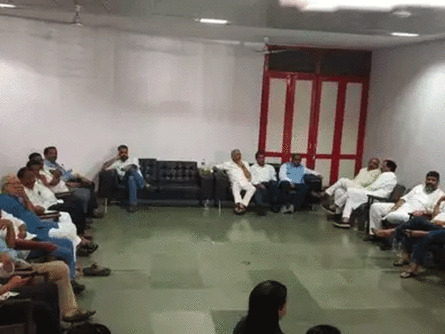 ET’s Rashmi Rajput reports: MGP’s Sudhin Dhavalikar has been offered Deputy CM.But his two MLAs aren’t signing because they want three corporations and three berths. BJP president Amit Shah, Union Minister Nitin Gadkari and BJP Goa MLAs including Pramod Sawant are at a meeting in a hotel in Panaji. Sources tell ET it’s almost done and that both allies have agreed to making Sawant the next CM. He lived a very simple life despite holding various positions and being learned. His only aim was to serve the people. He worked till his last breath. 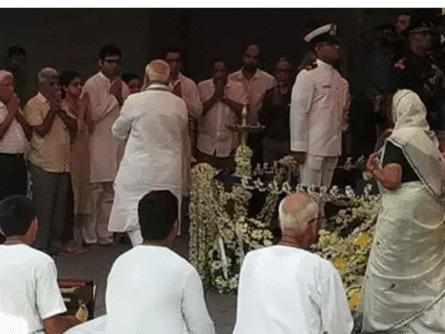 Panaji: Visuals from the last rites ceremony of late Goa Chief Minister #ManoharParrikar. The last rites of Manohar Parrikar are now on at miramar beach in Panaji. Among those present are BJP chief Amit Shah, Maharashtra CM Devendra Fadnavis and NSA Ajit Doval. Thousands have joined the funeral procession of Goa chief minister Manohar Parrikar to bid him a fond farewell. 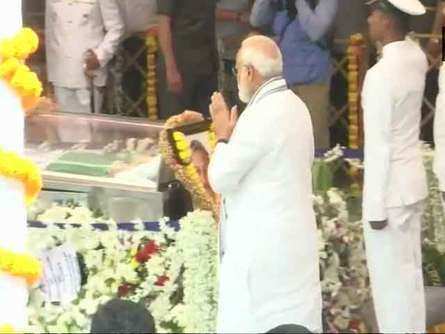 The mortal remains of the 63-year-old senior BJP leader were kept in a flower-decked hearse which left the Kala Academy here for the Miramar beach, where the last rites will be performed. Parrikar will be accorded state funeral with full military honours. Both the BJP allies – Maharashtrawadi Gomantak Party and Goa Forward Party – are demanding the post of deputy chief minister. Indications now are that the BJP may be forced to oblige both. The BJP has 12 seats and the allies have 3 each. The Congress has 14 seats. An artist from Amroha, Mohammad Zuhaib, pays his last respects to late Goa Chief Minister #ManoharParrikar by making a charcoal portrait. BJP’s Pramod Sawant most likely to be sworn in as Goa Chief Minister later today. Sawant is currently the speaker of Goa legislative assembly. Sources say the Goa Governor has returned to Raj Bhavan and that preparations for swearing in are on. 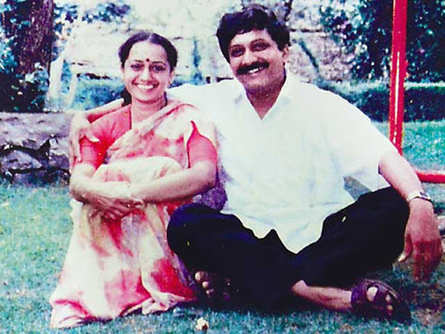 Parrikar’s body to be taken to SAG grounds, Miramar for final funeral rites. Panaji: Union Minister Smriti Irani gets emotional as she pays last respects to Goa CM #ManoharParrikar. PM condoles family of Manohar Parrikar. Sons Utpal and Abhijat, Parrikar’s siblings and daughters in law present. Prime Minister Narendra Modi, Defence Minister Nirmala Sitharaman and Governor Mridula Sinha meet family of Goa CM #ManoharParrikar, in Panaji. Sources tell ET that Pramod Sawant and Vinay Tendulkar ( state BJP chief) have emerged the front runners for the post of CM. PM Modi has landed in Goa and expected to arrive shortly at Kala Academy to pay last respects to Manohar Parrikar, reports TOI. 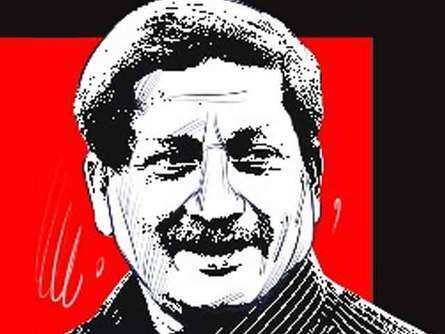 Manohar Parrikar’s fans line up streets, party office to pay tributes, reports PTI.